Mr. President: Enough talk, now action! 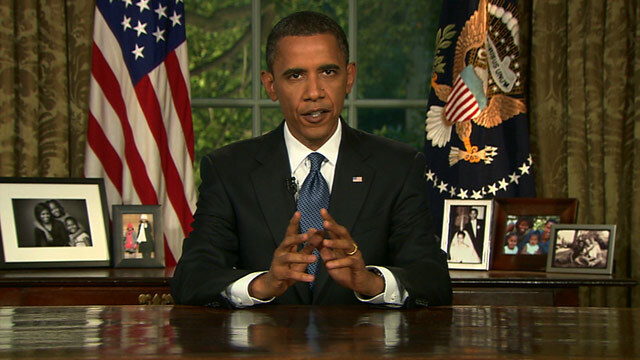 President Obama spoke to the nation about the oil disaster from the Oval Office on Tuesday night. Editor's note: Ed Rollins, a senior political contributor for CNN, is senior presidential fellow at the Kalikow Center for the Study of the American Presidency at Hofstra University. He is a principal with the Dilenschneider Group, a global public relations firm. He was White House political director for President Reagan and chairman of the National Republican Congressional Committee. New York (CNN) -- President Obama has given a lot of speeches. He's given hundreds since he became president. He's given six in the last two days on his trip to the Gulf. But last night's was the first speech he has given from the Oval Office. It will not be his last. But it was important, and he gave it well. It took him five paragraphs to say the serious words we have all known for weeks, but he needed to say: "This oil spill is the worst environmental disaster America has ever faced." He went on to say what every American and every victim of this disaster wanted to hear: "We will fight this spill with everything we've got for as long it takes. We will make BP pay for the damage their company has caused. And we will do whatever's necessary to help the Gulf Coast and its people recover from this tragedy." The rest of the speech didn't matter nearly as much. There were other things he wanted to say, and some of them were important. But the reality is that those 44 words quoted above are action items: We will fight with everything; we will make BP pay; and we will help our citizens recover. Now the president has to make it happen. As our nation's leader, he made commitments and they must be kept. Video: Did Obama deliver to Gulf residents? We all know the president can give a great speech. In fact, he's president because he first got noticed giving a speech. He gave many more inspiring campaign speeches and raised the expectations of millions of Americans that things would be different. Whether they are or not is up to each individual to judge. But why there was such a buildup to his giving his first Oval Office speech baffled me. The president sits at his own desk in the office he works in every day; he looks into the camera and reads the teleprompter. It's symbolic, but that's about it. My old boss Ronald Reagan gave most of his big speeches from the Oval Office. He felt that the office gave gravitas to his words. He had a unique ability to look into that camera and make most Americans feel he was talking to them -- a very special skill. Who can forget his speech from the Oval Office on the night of the Challenger disaster? The doubts people have expressed over the last several weeks about Obama were: Does he get it? And if he does, is he tough enough to do something about it? I think he gets it. I hope he's tough enough. I think the speech was a good speech. It was the public consumption speech. It was designed to make us feel better. The next speech he gives in the Oval Office is the one that counts. It's a private speech. When he meets Wednesday with the chairman and chief executive officer of BP, he needs to express the anger and disappointment of the nation and put a fear into this company that will move them to continued action and enough contrition that they won't quit until every last legitimate claim is paid. That's what we want to hear! The president closed his speech asking for prayers. "We pray for the people of the Gulf. And we pray that a hand may guide us through the storm towards a brighter day." I think what the American public wants is a president who will guide us through this storm. If we pray, our prayers are for him and those victims of this disaster. The time for speeches is over. No more words; just action!